Summer is here and I'm always looking for ways to beat the South Bay's heat. 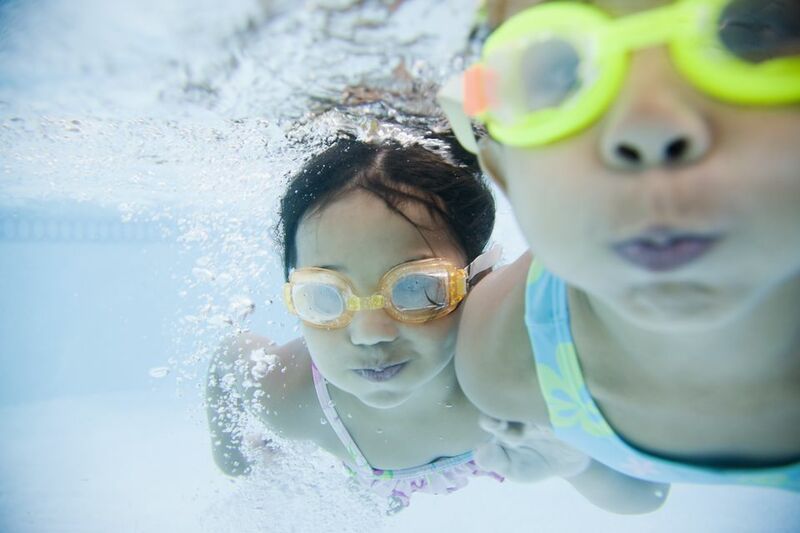 While a few of our public pools have cut back service or closed in recent years due to the ongoing California drought, there are still more than a dozen family-friendly pools, water parks, and aquatic facilities here in Silicon Valley. These places offer a fun way to escape from the summer heat. Click through the slideshow for a list of the best swimming pools, water parks, and splash fountains in San Jose and Silicon Valley. All of these pools are open to all ages. While memberships are available at some, all allow day passes or single day admission. The City of San Jose operates two public swimming pools in local community centers. Hours: Monday-Friday: 7:00am - 9:00am & 3:30pm - 6:00pm; Saturday: 9:00am – 3:00pm; Sunday: Closed. Open year-round. Admission: Adults: $6 day pass/$45 month; Student/disabled/senior (50+): $3 per day/$36 per month. Swim lessons are available, see website for details. Overview: Lap swimming is available in dedicated lanes, Monday through Saturday year-round with a lifeguard on duty at all times. The City of Santa Clara operates four swimming pools across the city. For more information, check their website. Hours: Open summers only. Recreational swim seven days a week. Adult lap swim Mondays through Fridays. Hours: Recreational swim on Saturdays and Sundays. Open summers only. Hours: Recreational swim on Monday, Tuesday, Wednesday, Friday, Saturday, and Sunday. Closed Thursdays. Open summers only. Hours: Recreational swim Monday through Saturdays. Open summers only. The City of Mountain View operates two public swimming pools in local parks. Hours: Open year round. Lap swim seven days a week. Recreational swim seven days a week (summer only). The City of Sunnyvale operates one public swimming pool on the campus of Fremont High School. Hours: Open seven days a week for lap swim. Water fitness classes Monday through Friday. Overview: Public swim and swimming lessons for both children and adults. The City of Campbell operates one public swimming pool in a local community center. Hours: Lap swimming--Seven days a week. Aquatic classes Tuesday, Thursday, and Saturdays. See the drop-in fitness schedule for hours. The City of Cupertino operates one pool at Blackberry Farm Park. Hours: Tuesday-Sunday, 10am-6pm. Open summers only. The City of Palo Alto operates one public swimming pool complex in a local park. The Rinconada Pool has one 14-lane lap pool plus a children's wading pool with lemon drop geysers and a circular waterfall. Hours: Open seven days a week for lap swim and recreational swimming. Summer only. Hours: Monday - Thursday: 3:30pm - 7:30pm; Friday 2:30pm - 7:30pm; Saturday/Sunday 1:00pm - 5:00pm. (Holiday Hours - July 4 & September 5: 1:00pm - 5pm.) Open May through September. Overview: Various programs from lap swimming, classes, and open swim. Hours: Monday - Friday, 9:00am to 11:15am & 1:00pm to 3:45pm. Saturday, 9:00am - 11:45am. Overview: Public swim and swimming lessons for children and adults. Hours: Recreational swim: Saturday and Sunday, 1:00pm - 5:00pm. The SJSU pool is closed for the 2016 summer season as construction begins on the new university recreation and aquatic center. The South Bay is home to three of Northern California's best water parks. Splash fountains (or "spray grounds") are a great way to cool off quickly on a hot summer day. These fountains, usually at city parks, are continuously spraying water formations that you can run through to cool off. In San Jose, both the Plaza de Cesar Chavez (intersection of South Market and San Carlos Streets) and the Mayfair Park (2039 Kammerer Ave.) splash fountains are running 11 a.m. to 9 p.m., seven days a week. In Sunnyvale, kids can play on a pirate-themed splash pad (the "S.S. Seven Seas") at Seven Seas Park (1010 Morse Ave., Sunnyvale, CA), pretend they are an astronaut at the space-themed splash pad at Lakewood Park (834 Lakechime Dr.), or step into a garden at Ortega Park (636 Harrow Way). Open daily 10-6pm. These City of San Jose parks have splash fountains, but they are turned off for the 2016 season because of the ongoing California drought. Find more information on the city website: Almaden Lake, McEnery Park, Bestor Art Park, McLaughlin Park, Butcher Park, Noble Park, Capitol Park, Parma Park, Carrabelle Park, Rainbow Park, Cataldi Park, Rosemary Garden, Cimarron Park, Roy Avenue Park, Erikson Park, San Tomas Park, Huerta Park, T.J. Martin, La Colina Park, Thousand Oaks, Lincoln Glen Park, Townsend Park, Martin Park.